A week-long field excursion during the wet, aimed at observing and identifying processes occurring on rock surfaces during wetter conditions, took place in February. Dating project researchers Helen Green, John Dodson, Damien Finch and KFA Science Advisory Council member Cecilia Myers carried out reconnaissance fieldwork with helicopter pilot Nick Sundblom who was also part of the team. For reliable radiocarbon dating remnants of older mud wasp nests, researchers must first prove that nests currently under construction return a modern age. The team located mud wasps and followed their route from mud source to the nest under construction on rock shelter walls. Detailed photographs and samples of these nests will vastly improve our understanding of the sources of carbon for radiocarbon dating of on art nests within this project. Uranium series and radiocarbon dating of mineral accretions forming both under and over the rock art will provide bracketing ages for the different art styles in the Kimberley. For the reliable application of these techniques, it is important that researchers can prove the origin of the accretions. During this trip, accretions unrelated to art sites were collected, as were water samples and swabs of microbial matter forming on the drip lines of shelter walls. Lichens, proposed as a primary pathway for the formation of certain minerals, and active predominantly during the wet season, were also identified and sampled. By the time the team return to the field in the dry (July) these samples will have been processed, aiding their targeted sampling of on art material, as well as using the generated data to support the emerging ages. 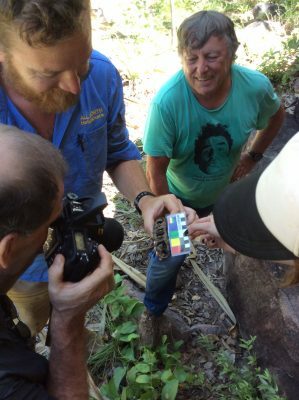 This pioneering work will provide some of the first wet season data to support rock art dating results in the Kimberley.